This page is a work in progress and will be updated as new developments emerge. If you have information you think should be added, please create an account to enable page edits or contact a Wiki Editor. 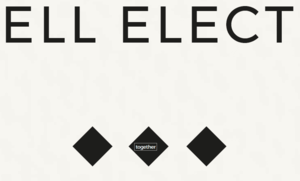 Bradwell Electronics is a promotional website released by Bossa Studios, a British game developer responsible for Surgeon Simulator and I Am Bread. At this time, the purpose of the site is unknown, but it is speculated to be an in-fiction promotional website for Bossa Studios' next game. Most of the content in this section is a rehash of this Reddit post by /u/blackbat24; all credit goes to him. 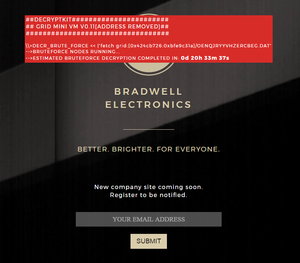 Welcome to Bradwell Electronics - Better. Brighter. For Everyone. Thank you for registering your interest for the upcoming relaunch of the Bradwell Electronics website. ----------This is a mayday alert. --------------------It is of concern to all of us. ------------------------------We ask you to trust us. ----------------------------------------We cannot do this alone. The first line of the text contains the string OENQJRYYVHZERCBEG; this can be deciphered using ROT13 to obtain BRADWELLIUMREPORT. The significance of this is currently unknown. Additionally, the final line of text in the red box is a countdown timer, which is counting down to 12:00 PM UTC, on March 8, 2017. This leads to archive page, which contains a press release about Bradwell's involvement in the restoration of Stonehenge in 2019, while the other file is a passworded zip. In addition, in order to access other parts of the site, a decryption key is needed to be added in the code of the website. Within the js of the website, large blocks of hex was found in the code which, when translated, included the decrypted data that was supposed to show only after the insertion of the decryption key. Just a few minutes later the decryption key (together) was found in the same translated js blob. With the 2nd key in hand, users unlocked the subsequent data and followed the instructions, but this still left the zip file encrypted and its content sealed. The book cipher hidden in the footer of the press release. Later that day, a series of numbers in the footer of the press release was found, which looked like a book cipher. It decoded as w3trusTu, a keyword that unlocked the content of the encrypted zip file. The internal memo contains the planned repairs to the A303 tunnel and the Stonehenge museum, but just like the press release it also stored a hidden message, together, the 2nd key needed for the advancement. It was later spotted inside the middle diamond, at the end of the footer, in a very small size font, black on black background. The second key, highlighted, hidden in the footer of the 060702019 internal memo. ---->DECRYPTION TIME CANNOT BE DETERMINED. The REGISTER link is a different tweet template, now reading @BetterBradwell #BETTERBE2026. It is yet unclear whether the alteration is a different step, or if it has simply being reworded (now reading USURPING SOCIAL MEDIA BANDWIDTH TO DECREASE DATA DECRYPTION TIME) to better instruct the players to tweet the message more. On March 16, around 15:40 UTC (3:40 pm), users starting receiving mentions. @username SEC TRIED TO SLOW US. DECRYPTION PRGRSS. Please accept our apologies if you recently received a direct tweet. The intruder has been suppressed and our systems have been updated. This could mean that no more tweets will be sent out, and that the updates will appear directly on the _FILEDATA in roughly a week time. PLEASE HELP!! I’m a technician at Bradwell Electronics and have made some important discoveries which need to be brought to light! I’ve managed to hack into the company’s social accounts, but think I’m being watched… Gotta go, but I’ll be back shortly! Ok, so that didn’t work. I tried accessing the docs by bouncing my connection off an external node but no use. I’m going to have to access a senior staff member’s computer, but how? Wish me luck - we’re all going to need it. This signaled to players that the ARG may be starting up again. This led players back to the Bradwell Electronics website. Players who signed up for the newsletter again received a new email, which can be seen here, and appeared to be an uncorrupted version of the email received previously in the ARG. In addition, the metadata of the new email contained the full text of the old, corrupted email. Good news - I’m on my way to one of the technician’s offices! I “accidentally” spilt coffee on them at lunch and managed to swipe their key card in the confusion. They’ve popped to the toilets to change but won’t be long. Now might be my only chance! Success! He’d left his computer unlocked, and I managed to download a file off the internal drives and get out before they returned. It won’t be long before he realises his key card’s missing though, and suspects I’m the reason. Time’s running out! After this tweet, two hour interval has been changed. It’s all here, and worse than I ever suspected. The only way this will get past the internal firewall is if I disguise the information within Bradwell Electronic’s ridiculous recruitment video! Ok… I’m going to need to get creative here. Stay vigilant, I’ll post again soon! Ok, progress is slow but I’m nearly there. I’ve managed to sneak some footage into the video but that's all I’ve got time for. Security seems to be on high alert, and it’s only a matter of time until they find me. My next post will be my last. They know it’s me, and are searching the facility as we speak! I’m uploading the video now and then you’ll finally learn what’s REALLY happening at Bradwell Electronics. IMP. ALERT: Yesterday, our social platforms were compromised but  we’ve since taken back control. In completely unrelated news 😏... we’re proud to announce our BRAND NEW TITLE, developed by A Brave Plan; The Bradwell Conspiracy. A snapshot of the dining area from the trailer. The trailer for the game is disguised as a recruitment video that lasts 45 seconds long. Per the infiltrator's promises, the video has been corrupted at many points throughout. Some of the corruptions show parts of the unrealeased game: A digger excavating at 0:15, a luggage searching area at 0:16, a meeting room at 0:18, a dining area at 0:20, and an open hallway at 0:21. All other distortions affect the colours and words of the video (e.g inverting the colour scheme of the video on some frames, and changing the words "bradwell electronics" into "brdawlel elketbomcs" at 0:29). With the release of the trailer, The Bradwell Electronics page was significantly overhauled. The website was now the host to all information regarding Bradwell Electronics, including the products they offer, recent news, the senior members of the company, and what the company is doing to help sustain the planet's future. A particularly important page of the website is a contacts page. This contains a phone number: +443300431835,and also contains an email address: [email protected] The email is not real (or not registered yet) and causes and error email to be sent by google. Hello, and thank you for calling Bradwell Electronics. Better, Brighter, For Everyone. To speak to a product sales representive, press 1. To reach a customer support agent, press 2. To leave us a message, press 3. For more information about our products and services, please visit us at www.bradwellelectronics.com. To repeat this message, press 9. All our agents are extremely busy at the moment. Please press 1 to leave a message, and we will get back to you as soon as we can. It is unclear whether leaving messages will have any effect on the ARG. The code is of an unknown length, and has not been discovered yet. It is unknown whether the code can be figured out now, or whether we must wait for more clues to be given out. A recording of the number can be found here. Another website was also created specifically for the game and the actual real life people that have worked on it. This website should not contain any clues related to the progression of the ARG. The game featured at EGX2018 between 20th-23rd September at The NEC in Birmingham. There was a showcase of the game, and the game could be played by any member of the public. As part of the advertising of the game, a branded Bradwell water bottle was given to those who went to the showcase. The bottle contained 2 items of interest: A QR code and a barcode. The QR code, when read, directed the user to the about page of the Bradwell website. The Barcode (after much editing and trial and error), when read, says "Bradwell RnD". Bradwell R&D is created as a separate company by Eliza Bradwell (previously Winters). Focusing on researching new technology, Eliza always believed that complacency was not an option for Bradwell Electronics. Immediately below this is a one character link that takes you to a login screen. It asks for a login and a password. Until 10/17/2018, this was not solved. However, eventually, the correct login was input, and within a few minutes, so was the password. This turned out to be the password, and the account of gmcnamara was unlocked. All of the documents can be found here. The first 2 PDFs can be accessed by just using the retr command. The zip requires a code from the "SECONDARY AUTHENTICATION MECHANISM". Using the code given (9415) in the Secondary Authentication System on the Bradwell Electronics Phone Number, another code(AF52426544) is given that can be used to open the document. The final document requires the use of the dbg command. It requires 10 hashes to be decoded, 2 already given. It was initially unknown how to get these hashes. However, it was soon discovered that each person logged into the account was connected to 1 of 5 nodes, with each node giving 2 different hashes. The First PDF seems to take the form of a press release about Bradwell Electronics stepping in to save Stonehenge. The Second PDF is a confidential analysis on said Stonehenge Museum repair. Finally, the Final PDF contains an analysis on said test results. This is the most significant of all the documents, as it implies the discovery of the element that is mentioned in the promo video, "Bradwellium". This may also be a key plot point for the game's release. The game's release date is still unknown. This page was last edited on 18 October 2018, at 19:34.